I think there are quite a few AutoHotkey users here on Donationcoder so I thought I'd post a note about my program here. Background: this is a program (script) I've developed and used for a long time. It was inspired by the Textmate Bundle/Snippet concept which a few years back was hardly available in a Windows text editor. Lintalist has the advantage it should work in any program (as long as it allows AutoHotkey to paste text) not just your editor. Some might compare it to the "tag list" or "clip libraries" you might find in some text editors as well. Lintalist is an open source program written in AutoHotkey which allows you to store and (incrementally) search and edit texts in bundles and paste a selected text in your active program. The text can be interactive, for example you can automatically insert the current time and date, ask for (basic) user input or make a selection from a list etc and finally it can also run a script. You can use keyboard shortcuts or abbreviations to paste the text (or run the script) without opening the search window. Bundles can be context sensitive and multiple bundles can be used at the same time (if they match the criteria). If you write your text in HTML or Markdown you can paste formatted text (bold, italics, images, links etc) into your documents or emails. You can also directly read RTF or Images to paste as well. 2. Menu + search options. 3. Result list with Part 1, Part 2, Key(board shortcut), Short(hand, abbreviation). Columns are dynamic, if part 2, key or short are not present in the loaded bundle(s) they will not be displayed. 4. Preview of top most or selected snippet text. In statusbar: loaded bundle(s) and hits / number of snippets. Edit2: forgot to add that is a fully portable, it stores everything in the folder the program resides in (settings and bundles). When you run it for the very first time it does ask if you want a shortcut on your desktop or would like to automatically start it with Windows but if you answer don't do that you can run it from a USB drive or dropbox account for example. Bravo, Congratulations, and Thank You! a program (script) I've developed and used for a long time. Edit: forgot to add that is a fully portable, it stores everything in the folder the program resides in (settings and bundles). When you run it for the very first time it does ask if you want a shortcut on your desktop or would like to automatically start it with Windows but if you answer don't do that you can run it from a USB drive or dropbox account for example. fully portable, it stores everything in the folder the program resides in (settings and bundles). When you run it for the very first time it does ask if you want a shortcut on your desktop or would like to automatically start it with Windows but if you answer don't do that you can run it from a USB drive or dropbox account for example. Lintalist looks like it could be a pretty powerful tool. I see what you mean about the TextMate concept for Windows. A few really useful applications in DOS/Windows started off being cribbed from the Mac environment and being transplanted into Windows. Note: although Lintalist can expand abbreviations it is not intended to replicate or replace the native AutoHotkey Hotstrings features, see http://ahkscript.org/docs/Hotstrings.htm for an introduction and description of all the options. Feedback welcome: https://github.com/l.../lintalist/issues/49 or here of course. New: SnippetEditor Setting - Allow user to set editor to use for "Edit in Editor". New: PlaySound Setting - Play sounds after paste, open or close of Search Gui (beeps, default Windows media or user files). New: Added help menu with 'Help' and 'About' options to the GUIs and added 'About' to tray menu. New: Split plugin now accepts "named Split" [[split_name]]. Fix: Tray menu: manage bundles and manage local variables weren't working. Fix: Always resolve Vars in nested situations. Various other minor fixes, code refactoring and documentation. If you are upgrading to this new release, you can use the tray menu option "Check for updates" and have it done automatically. A quick note about the "named splits" - just in case you're wondering how useful the [[split]] plugin is, here is a short example how you can use it to create a Snippet with "logic". You can use Choice (or another Plugin) to select an item and use that output to update other parts of the snippet. This will ask you to make a Choice from Option1..4, and if you pick Option3 it will use "3" as a selection criteria for another Split. Fix: After using quick search with one result e.g. 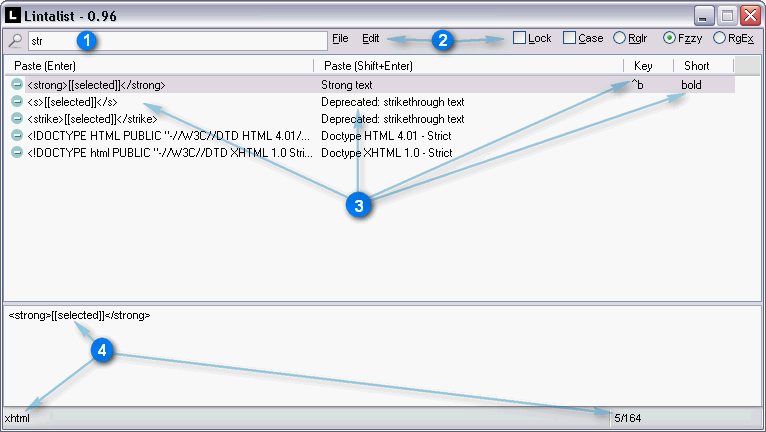 automatic pasting of the only snippet, pressing space or tab executed the snippet again. Cleared the typing history after each paste fixed it. and as always feedback welcome! New: Additional safety check when processing snippet by "removing" faulty plugins plus a simple error check when saving snippets. Change: User plugins (and now functions) can be added to MyPlugins/MyFunctions so future updates of Lintalist won't overwrite plugins/functions added by users each time. See NOTE below. Thanks for continuing to improve and share! Hi, I got curious and downloaded Lintalist and it seems very useful but far more powerful than I will ever need. I tried to paste into a command prompt but it didn't work, the cursor just changed to a block and nothing appears. Is that a limitation of how the command prompt window? Yes, the command window can be special depending on the Windows version you are using. Note that it actually sends shift+insert to paste as that (should) be defined in AltPaste.ini - see https://github.com/l...ter/docs/AltPaste.md for more information - that should work in Windows 10 by default. It should now use the alt-space-edit-paste shortcut to paste text, that may not always be the most reliable method but it should work. I hope that explains it and is useful. I have carried out your instructions on Windows 7 and it seems to work, so thanks for the solution. Tried it after you mentioned it in another thread. Working well within the idea frame I had. One question. Is there a max size that a bundle can be. Already hitting 500KB and there is no end in site for how large I might take it. So how large can it go and will there be a slow down once it gets to a certain size. Should I be making multiple bundles to share the load or does this matter? All bundles are loaded in memory so that shouldn't matter much, depending on the context only some are shown/used in the Gui while searching so that might have an influence. Say you have a HTML bundle there no need to always show it as you only need while editing HTML files, but that bundle is loaded at startup.